This is a must have tool for any avid rc lipo user! Dont run a low voltage Lipo Pack ever again! Works with battery Li-Ion, LiPo, LiFePO4, NiCd, and NiMH. Its a quick, convenient, easy-to-use device. 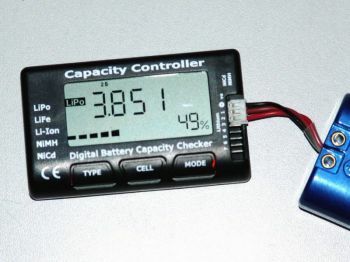 It shows at a glance the remaining capacity (displays both percentage and voltage) in your battery pack, cell balance, and other information you need to get the best performance and reliability from your batteries, and avoid costly mistakes.